Tofu, when cooked incorrectly, tends to be dry, bland, rubbery and hopelessly flavourless. But it doesn't have to be that way! Here is a very simple method for making delicious, intensely flavourful, soft-on-the-inside-and-crisp-on-the-outside stovetop tofu. No pressing, no marinating, no freezing or deep frying necessary. Cut the tofu into approx. 1cm cubes (or whatever shape you like, just not too big or the centre won't get enough flavour). In a large frying pan (I like to use nonstick) - heat the oil over medium-high heat. Toss in the tofu cubes to coat. Then add in the remaining ingredients except the nutritional yeast (which only goes on at the very end). Give it all a good mix until all the tofu pieces appear uniformly coated, and ideally all in a single layer. Now here is the important part: You want those edges to caramelize and get really crispy - so don't stir too often! Let the tofu sit in the hot oil without touching it for a good 2-3 minutes before turning it. Once you get nicely browned sides, give it a good toss and flip the tofu pieces around. You don't need to be overly meticulous about it, and you don't need to get all 6 sides of each cube perfectly browned. Keep doing this a few more times until you're satisfied with the browning (you want deep brown spots not black - burnt tofu really doesn't taste good). Finally, remove the pan from the heat completely. Then sprinkle on the nutritional yeast flakes and toss it all around. 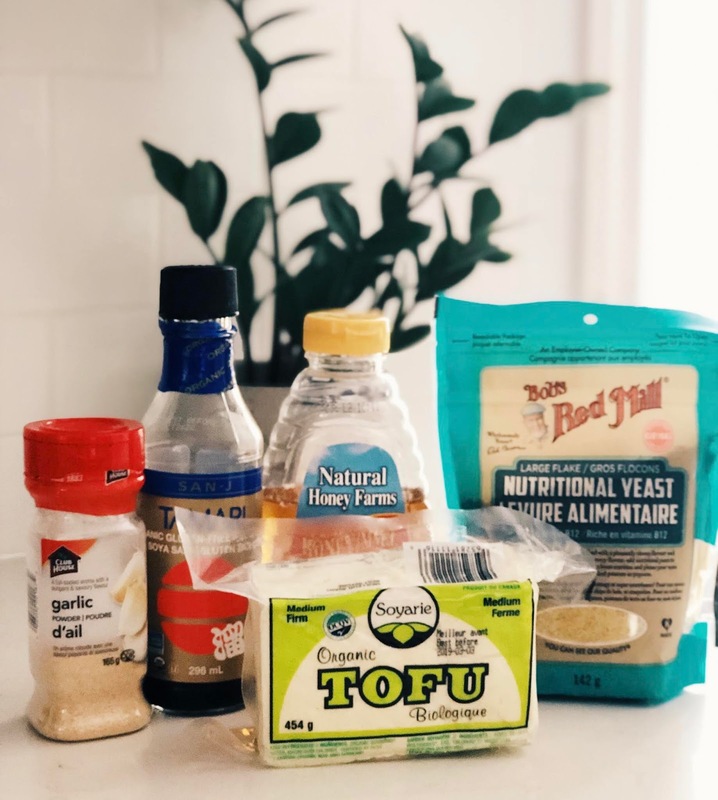 You'll notice that the yeast flakes "soak" up the remaining oil and help it adhere to the tofu - which is what you want! Taste and adjust with more salt and pepper if needed. *On choosing tofu: I'm not a huge fan of "extra firm" - I find it too dense. I prefer "medium firm" if you can find it. You can also use "extra firm silken tofu" which is much, much softer and breaks apart easier. But if you're careful when turning it in the frying pan, it's absolutely delicious when cooked with this same method. ** Tofu has very little fat in it - and we all know fat = flavour. 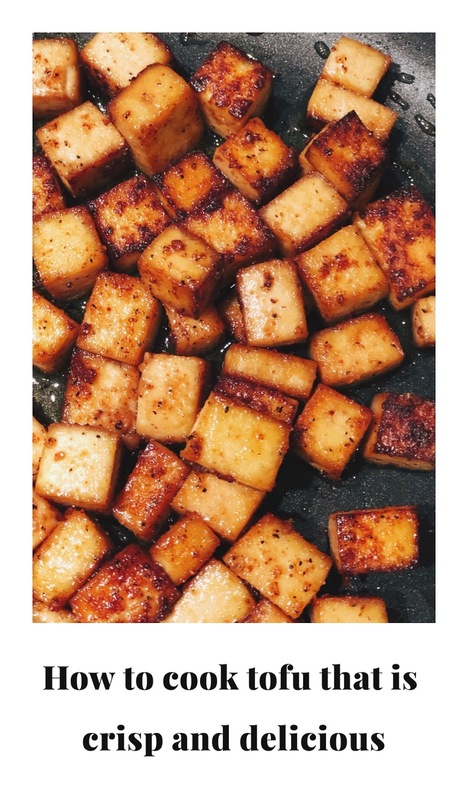 So you need to be generous with your oil when cooking tofu. This is true for most vegetarian cooking, in my opinion. Choose any oil you like (I usually use olive) just don't be stingy. *** Why sweetener you ask? 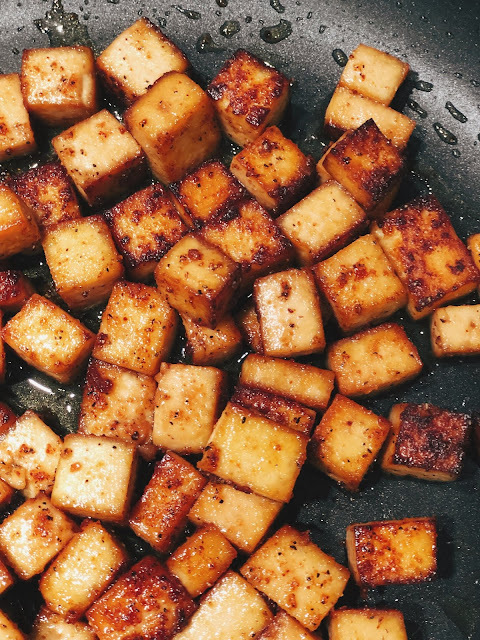 This is the secret to getting super crisp caramelized edges to your tofu. It's not that much but packs a big punch. It turns tofu from ordinary to extraordinary. **** Nutritional yeast flakes - this is totally optional but is truly the finishing touch. It adds amazing umami flavour and the je-ne-sais-quoi deliciousness that is too hard to explain. And it's loaded with vitamins. ~ On flavouring: you can adapt this method in so many ways. Use a bit of sesame oil and toss in black sesame seeds at the very end. Use a bit of sriracha or chile paste/flakes, or any kind of heat - always a welcomed addition when cooking tofu. Sprinkle in dried herbs or paprika. But most of the time I use this basic method above, with very few additions.